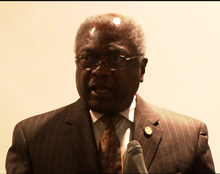 House Majority Whip James Clyburn speaks during the BLT program reception. Click here for video highlights of the program's reception. WASHINGTON, DC - The NAB Education Foundation (NABEF) yesterday celebrated the 10th anniversary of the Broadcast Leadership Training Program, a curriculum that teaches senior level broadcast executives the fundamentals of purchasing, owning and successfully operating radio and television stations. To date, 37 percent of the alumni of the BLT Program have received one or more promotions and 28 former students have purchased stations. The reception, held at the U.S. Capitol, included program alumni, faculty and current students, as well as featured guest House Majority Whip James Clyburn (D-SC) and emcee Alison Starling, co-anchor for Good Morning Washington and WJLA-TV's ABC 7 News at noon. Senator Kay Bailey Hutchison (R-TX) and FCC Commissioners Michael Copps and Robert McDowell were also in attendance. "Since 2001, the Broadcast Leadership Training Program has helped advance the careers of nearly 160 broadcasters," said NAB Education Foundation President Marcellus Alexander. "Last night's reception provided the perfect opportunity for the NAB Education Foundation to honor the program graduates, faculty and sponsors who have made this program such a success." The reception paid tribute to the graduates of the program, as well as program founder Diane Sutter, ShootingStar Broadcasting LLC President and CEO. The program sponsors, Bayou City Broadcasting, ICBC Broadcast Holdings, Inc., Legend Communications, Morgan Murphy Media, NAB, The Hearst Foundations, the McCormick Foundation, the New City Foundation and TDF were also honored for their support in helping expand diversity through the fellowship program. The fellowships, offered to women and people of color, are available for up to 75 percent of each class. The program's ten-month long "MBA-style" curriculum is divided into a series of five intense four-day sessions taught by FCC Commissioners, lending and equity professionals, broadcasters and attorneys. Topics discussed include strategies for developing a successful business plan and securing financing, identifying and evaluating stations, negotiation tactics, advice on working with the FCC and performance management tips. This year also features a new mentoring component between current and past graduates that expands on the networking and learning opportunities offered during the classroom section of the program. For additional information on the program, click here. A video clip of the reception highlights is available here.